This printable devotion for kids entitled “What is Love?” is the second of its kind. Click here to see the first devotional plan about hope. Children are given a scripture to read and a question to answer each day to practice studying God’s word. This particular topic is important because biblical love is one of the most misunderstood topics in today’s world. The devotion outlines the truth concerning love, and there is also an instruction page that may be passed out. 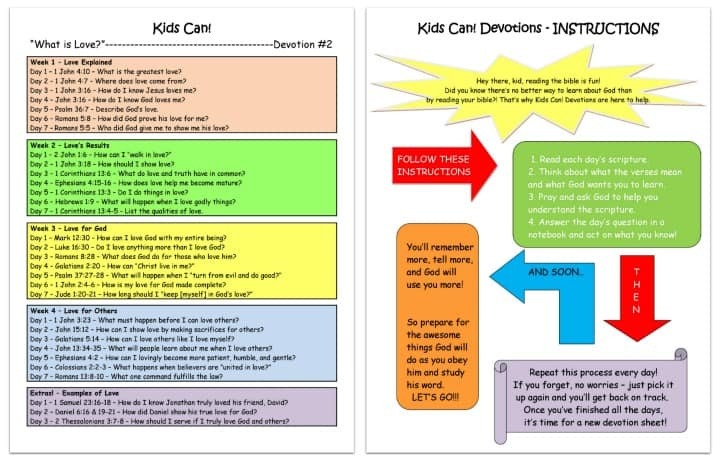 With these devotions, children can go at their own pace and not necessarily have to fit all the devotions in one month. The important thing to remember is that children have to, at some point, begin taking responsibility for their own growth in the faith, so this is a great way to start! Day 1 – 1 John 4:10 – What is the greatest love? Day 2 – 1 John 4:7 – Where does love come from? Day 3 – 1 John 3:16 – How do I know Jesus loves me? Day 4 – John 3:16 – How do I know God loves me? Day 5 – Psalm 36:7 – Describe God’s love. Day 6 – Romans 5:8 – How did God prove his love for me? Day 7 – Romans 5:5 – Who did God give me to show me his love? Day 2 – 1 John 3:18 – How should I show love? Day 3 – 1 Corinthians 13:6 – What do love and truth have in common? Day 4 – Ephesians 4:15-16 – How does love help me become mature? Day 5 – 1 Corinthians 13:3 – Do I do things in love? Day 6 – Hebrews 1:9 – What will happen when I love godly things? Day 7 – 1 Corinthians 13:4-5 – List the qualities of love. Day 1 – Mark 12:30 – How can I love God with my entire being? Day 2 – Luke 16:30 – Do I love anything more than I love God? Day 3 – Romans 8:28 – What does God do for those who love him? Day 6 – 1 John 2:4-6 – How is my love for God made complete? Day 1 – 1 John 3:23 – What must happen before I can love others? Day 2 – John 15:12 – How can I show love by making sacrifices for others? Day 3 – Galatians 5:14 – How can I love others like I love myself? Day 4 – John 13:34-35 – What will people learn about me when I love others? Day 5 – Ephesians 4:2 – How can I lovingly become more patient, humble, and gentle? Day 7 – Romans 13:8-10 – What one command fulfills the law? Day 1 – 1 Samuel 23:16-18 – How do I know Jonathan truly loved his friend, David? Day 2 – Daniel 6:16 & 19-21 – How did Daniel show his true love for God? Day 3 – 2 Thessalonians 3:7-8 – How should I serve if I truly love God and others? I so appreciate your web sight and sharing with all of us. I love teaching the kids and these are very helpful. thanks! This is the second in the series and we hope to post more. Here’s the link for the first. Tony Kummer (Editor) reviewed & updated this page on : July 16, 2016 at 12:48 pm. All our content is peer reviewed by our readers, simply leave a comment on any post suggest an update.